Melissa K. Burrows, Ph.D. joined the Jackson Administration in October 2014 as the Director of the Office of Equal Opportunity. As Director, she is responsible for monitoring and enforcing Codified Ordinances as a way of promoting equity and inclusion efforts through compliance to goals and promoting “Self Help.” Major functions of the office include: certifying businesses as local, minority, or female-owned; evaluating City contracts related to use of minority and female businesses, employees, and local companies; determining goals and requirements for city contracts; monitoring of contractor's compliance with various contract requirements; training on information for contractors and potential contractors; investigating and imposing penalties for failure to comply with the office’s programs; providing technical support for target businesses and outreach. Prior to joining the Jackson Administration, Burrows served as the Faculty Diversity Officer at Case Western Reserve University, where she was responsible for providing oversight of university compliance with equal opportunity and affirmative action laws and regulations; as well as assisting with diversity and inclusion efforts. Additionally, Burrows worked at KeyBank as the Diversity Measurements Manager, where she was responsible for leading efforts in translating the value proposition of diversity and inclusion efforts on the corporation and building the business case for diversity. Burrows has also taught as an adjunct faculty at various institutions of higher learning. 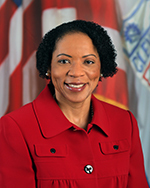 Burrows received her Ph.D. in Public Administration and Urban Affairs from the Levine College of Urban Affairs at Cleveland State University; a master’s degree in Urban Planning and Policy from the University of Illinois at Chicago; and a Bachelor of Arts degree in Sociology from The Ohio State University. Burrows has served in various civic and board capacities and currently serves on the board of the Consortium of African American Organizations (CAAO). She is an active member of her church, Mt. Zion Congregational Church, United Church of Christ in University Circle. Originally from Dayton, Ohio, Burrows is an 18-year resident of the Fairfax neighborhood and the former board chair of Fairfax Renaissance Development Corporation. She is married to Grady Burrows and they have two sons ages sixteen and eight.